Volunteers outside the Lillian Marrero branch of the Free Library of Philadelphia distribute food supplied by Philabundance’s Fresh For All program to residents in Fairhill. In grim and startling detail, a new five-year federal survey of poverty in Philadelphia shows a city still not recovered from the Great Recession — with white poverty exploding, inequality becoming the norm, and an out-of-the-way neighborhood experiencing some of the worst ravages of privation. Being released on Thursday, the U.S. Census Bureau's American Community Survey (ACS) Five-Year Estimate for 2013 through 2017 takes a microscope to the city's formidable 26 percent poverty rate, revealing fault lines of distress and hardship. Fairhill in North Philadelphia registered a stunning 61 percent poverty rate. The neighborhood of Eastwick in Southwest Philadelphia, near Philadelphia International Airport, showed the greatest poverty-rate increase of any community, rocketing from 12 percent during 2006-10 to 26 percent in the newest survey. That means that even after the recession ended, around a decade ago, conditions in Eastwick have gotten much worse than during the depth of the downturn. White poverty throughout much of the city skyrocketed, led by the Northeast neighborhood of Holmesburg, which went from a 2 percent poverty rate to 19 percent. The median household income of Tioga-Nicetown plummeted from $28,026 to $17,493, the largest drop in the city. At the same time, the Graduate Hospital area (also called Schuylkill/Southwest Center City) had the highest median household income at $91,445, supplanting Chestnut Hill as the richest neighborhood in the city. In comparison, Fairhill's median income dropped by about $300, to $15,979. Thus, inequality in the city has a precise measure. It's $75,466, the gap between the median household incomes in the Graduate Hospital area and Fairhill. Overall, the median household income is $39,759, a fall from the $41,449 between 2016 and 2017, census figures show. The ACS numbers are calculated by surveys taken over five-year periods. They're based on samples of population and are subject to margins of error. But, experts say, the results are striking all the same. "It's a little shocking to see poverty continue to rise robustly in a period of time after recovery from the recession, with a stronger economy," said labor economist Mark Price of the Keystone Research Center in Harrisburg. "It indicates that some neighborhoods became destinations for impoverished households to move into. Or, simply, the conditions have gotten worse." New census figures show sharp increases in poverty in several neighborhoods in Philadelphia, and stunning increases in wealth in other pockets in the city. The latest data are from a five-year survey between 2013 and 2017. Comparisons reflect changes from the 2006-2010 five-year period. The Fairhill story continues to astound people who live and work in a place where just 39 percent of the population is not poor. "These numbers bring tears to my eyes," said David Chiles, executive director of Providence Center, which offers education programs for children and adults in the neighborhood. "The last decade-plus has shown a widening of the gulf between the very, very wealthy and the communities that are struggling economically. "Here you have kids in shoes that don't fit them, coming from the Dominican Republic, Puerto Rico, and Mexico wearing sweatshirts and not coats," he said. "They skip meals, they live overcrowded. And on every corner, people sell drugs." Temple University sociologist Judith Levine said, "A number like 61 percent is total crisis." "That's just an upsetting, astronomical poverty rate," she added. Crystal Gerardo carries a box of produce supplied by the Philabundance Fresh For All program in Fairhill. 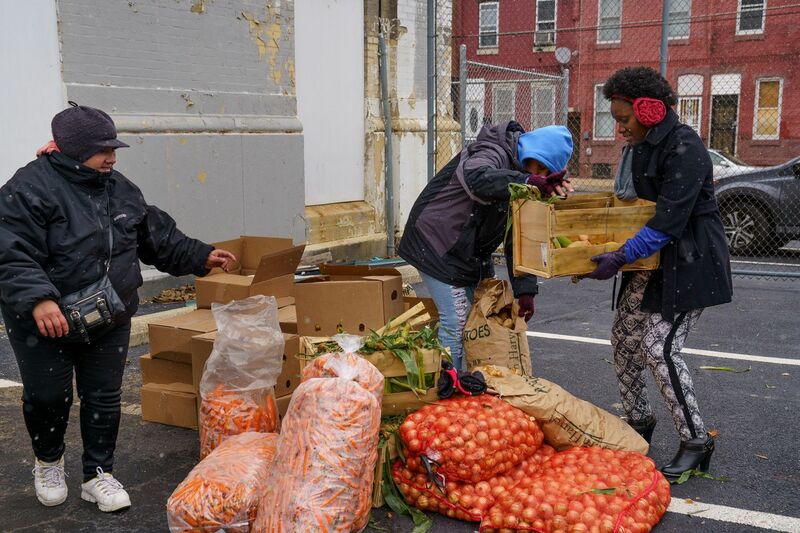 In a lot behind the Lillian Marrero Branch Library on Wednesday, neighborhood people gathered for produce provided by Philabundance, the region's leading anti-hunger agency. During a snow squall, Crystal Gerardo, a 19-year-old sophomore at Community College of Philadelphia, collected vegetables for herself and her father. Gerardo said she lives in poverty among so many others who find themselves in "daily chaos — literally chaos." She added, "Poverty makes people lose their minds. The violence, the food insecurity, the homelessness, even the falling-down buildings and stray animals in the street. Awful." It's a hard problem to solve, noted Neeta Fogg, a Drexel University economist. Entire chunks of the population in Fairhill, Tioga, and other low-income areas are not looking for jobs because they've been endlessly discouraged by failed attempts at employment. Among people living in deep poverty — 50 percent or more below the federal poverty rate of about $21,000 a year for a family of three — 75 percent are disconnected from the workforce, Fogg said. "The ones who stop looking for work have no skills, have low education attainment, and have no experience," she added. "The gap between what you have to offer and what the labor market wants is so big, you have no chance." Philadelphia’s richest neighborhood, Schuylkill-Southwest Center City (also known as Graduate Hospital) had a median household income of $91,445 in 2013-17. That’s $75,466 more than in Fairhill, the city’s poorest neighborhood, where the typical household income was only $15,979. As the Fairhill survey statistics showed people living in poverty becoming even poorer, another phenomenon announced itself in the census numbers. In September, the census released a one-year survey that found that while poverty among minority groups stalled or decreased, poverty among white people in Philadelphia shot up from 14.8 percent to 19.4 percent between 2016 and 2017. The more detailed survey released on Thursday revealed that the poverty rates in 22 majority-white neighborhoods in Philadelphia increased between the 2006-10 survey and the 2013-17 survey — in some cases quite dramatically. Holmesburg recorded the highest increase, from 2 percent to 19 percent. Experts, hearing about the data for the first time on Wednesday, struggled to explain why. "This community never bounced back from the recession," said Tricia Neale, a minister and executive director of Feast of Justice food pantry at St. John's Lutheran Church in Mayfair. In that neighborhood, the poverty rate rose from 1 percent to 14 percent. Many residents who were barely holding on have blown through their savings, lost access to social-network programs, and are living at rock bottom, she said. But there's another reason so many white people are falling into poverty, some surmise: opioids. "A lot of people have blinders on and don't want to believe this, but drugs are all over Northeast Philadelphia, and a lot of addiction is going on," said Revonne Watson, food pantry director at Holmecrest Homes in Holmesburg. In so many cases, grandparents are raising grandchildren because parents are suffering from addiction, Watson said. "We're starting to see a lot of homelessness up here because of rampant drug use." Paul Sachs, executive director of Merakey Philadelphia, a nonprofit that helps people with substance abuse disorders and mental illness, said he also believes "opioids are an explanation" for increased white poverty. Aside from the cost of maintaining an addiction, drugs "affect your behavior, which can cause work-related problems." People lose their jobs and fall into poverty, he added. While drug usage may account for some white poverty, another reason may simply be old age. "The neighborhoods are getting grayer and older," said Andre Krug, CEO of KleinLife, a social service organization in Somerton. "When people retire and stay in the neighborhood, it makes the area poorer," Krug said. He added that Northeast Philadelphia continues to see white immigrants from Russia "who tend to be very poor" flock to the area. Along with the tragedy of Fairhill and the travails of white, low-income Philadelphians, the Five-Year ACS had another story to tell: the poverty slide in Eastwick. With no time to study the data, experts were hard-pressed to explain why the poverty rate spiked in that particular neighborhood, which looks like a combination of Northeast Philadelphia, a widespread suburb, and an inner-city community. Kathy Fisher, policy director at the Greater Philadelphia Coalition Against Hunger, said she wondered whether the high rate of evictions in West Philadelphia were pushing people southwest to Eastwick. She also suggested that a growing number of low-income immigrants from Africa who are settling in Eastwick might be affecting poverty rates. The large African population could be at the heart of it, noted Andrea Lemoins, a community organizer with the Free Library of Philadelphia's Eastwick branch. "It's a low-income community where public transportation is really sparse, and it's cut off from the rest of the city," she said. Stephanie Clark, 41, and her husband, Jason Graham, 39, outside the Eastwick Mission House, which runs a food pantry to help low-income residents in the area. Jason Graham, 39, was walking with his wife, Stephanie Clark, 41, in Eastwick on their way to the Eastwick Mission House to get food from the pantry there. The couple have three children, aged 10 to 15. A construction worker who took in $300 last month, Graham said no one should judge "the down and out." He added, "There just aren't jobs for me, but it could be worse. We still have each other in our family." Ultimately, said David Chiles of Providence Center in Fairhill, the city should be frustrated and angered by the census numbers that depict the plight of people like Graham. "Numbers like this say that something in Philadelphia is massively broken, and we have to rethink what we're doing to help people," he said. "The acceptance of suffering is unconscionable to me."